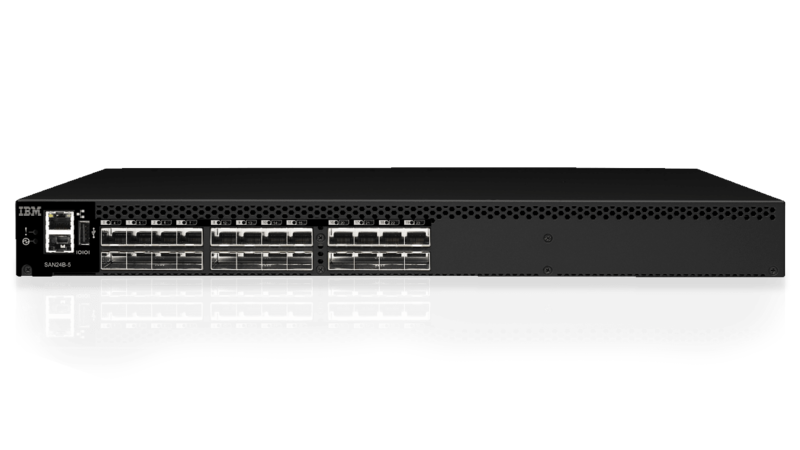 The IBM® System Networking SAN24B-5 features both Gen 5 Fibre Channel and Fabric Vision technologies—providing outstanding price to performance value in an entry-level switch. SAN24B-5 offers the flexibility, simplicity and enterprise-class functionality to gain the full potential of high-density server virtualization, cloud architectures and next-generation storage. It simplifies server virtualization and virtual desktop infrastructure management while meeting the high-throughput demands of solid-state disks. By delivering high reliability, availability and serviceability, downtime is minimized in mission-critical environments. SAN24B-5 is configurable in 12 or 24 ports and supports speeds up to 16 Gbps in an efficiently designed 1U form factor—giving you flexibility, simplicity and enterprise-class functionality. With the EZSwitchSetup wizard, deployments are simplified and support high-performance fabrics by using ClearLink Diagnostic Ports (D_Ports). Fabric Vision technology helps maximize uptime, simplifies SAN management, and provides outstanding visibility and insight across the storage network.